Helmets for kids: They won’t protect your children from concussions and other common head injuries. They won’t protect your kids from concussions. Why don’t companies start making concussion-proof helmets? Putting aside the debate over whether helmets are truly necessary in all of these situations, there’s something about helmets that you might not know: They won’t protect your kids from common head injuries that may cause long-term problems. There’s no question that helmets save lives by preventing skull fractures and other lethal brain injuries. But according to a 2013 report on youth sports-related concussions by the Institute of Medicine and the National Research Council, “there is limited evidence that current helmet designs reduce the risk of sports-related concussions”—minor traumatic head injuries that have been tied, at least in adults, to long-term neurological problems including depression, chronic traumatic encephalopathy (a neurodegenerative disease) and chronic cognitive impairment. That helmets don’t protect against concussions is particularly worrying considering that children and adolescents may be both more vulnerable to concussions and recover more slowly from them compared to adults. And statistics suggest that concussions are becoming more common among kids—one recent study, for instance, reported a doubling in concussion-related ER visits by youth between 1997 and 2007. Some of this increase is undoubtedly due to growing awareness about concussions and better diagnostic techniques, but concussions are still believed to be underreported: When researchers surveyed 12-to-17-year-old soccer players about their concussion history, only 7 percent of them ever reported suffering concussions, but a whopping 48 percent said they had experienced concussion symptoms at least once, which suggests that far more kids are getting concussions than are being diagnosed with them. There’s no good treatment for concussions, other than rest (for days, weeks or months, depending), but this rest is crucial: individuals who get concussions and then hit their heads again before they’re fully healed can suffer brain swelling and even die. So why don’t companies start making concussion-proof helmets? I mean, if there’s a market for baby helmets, these puppies would fly off store shelves faster than quinoa on clearance. One problem is that there’s a lot the medical community still doesn’t understand about concussions. If you try to find a definition for concussion in the scientific literature, you’ll find a vague and confusing description along the lines of “a traumatically induced transient disturbance of brain function” that “involves a complex pathophysiologic process.” Concussions are typically diagnosed based on symptoms—headaches, dizziness, amnesia, nausea, and vomiting are among them—but as for what kinds of blows to the head cause them, that’s still largely a mystery. “I couldn’t even define the mechanism,” explains Adam Bartsch, Director of the Cleveland Clinic’s Head, Neck and Spine Research Laboratory. And we can’t come close to designing a concussion-proof helmet, he says, until we understand exactly how concussions happen. Nevertheless, there are a few hints. For one thing, concussions typically develop after lower-impact head hits—ones that aren’t as forceful as those that crack skulls. Research suggests that concussions are also caused in part by impacts that cause the brain to rotate inside the skull, or what is called rotational acceleration. This kind of acceleration is believed to damage nerve fibers called axons, leading to concussion symptoms. So in theory, a helmet that mitigates this kind of acceleration at lower-than-lethal impact forces might help prevent concussions—and would be especially great for young athletes, considering that the many common blows to the head endured by high school football players induce rotational acceleration and are usually these lower-impact hits. Problem is, current helmet standards—both for kids and adults, and for all sports— totally ignore rotational acceleration. As a 2013 paper by Virginia Tech researchers put it, “there currently is no federal or industry head injury safety standard that considers rotational acceleration, even though there is strong evidence linking it to injury.” Indeed, today’s sports helmets are designed to attenuate high-impact linear acceleration forces, which occur in a straight front-to-back line, like “if you hit the head through the center of gravity,” explains Robert Cantu, a neurosurgeon at the Boston University School of Medicine and co-author of Concussions and Our Kids: America’s Leading Expert on How to Protect Young Athletes and Keep Sports Safe. Let me explain. In the event that your daughter flies off her bike and hits the ground head-first, her helmet will do two things. First, the outer helmet shell will spread the force of impact over a greater surface area, lessening the blow to the part of her head that hits pavement. Then the inner EPS foam liner will crush, increasing the amount of time over which the force is applied to her head—what Barcott describes as “slowing the blow.” The problem, he says, is that EPS only begins to crush under very large forces; it doesn’t deform in response to the less severe impacts that typically cause concussions, so in these crashes it doesn’t do anything helpful. Ideally, what manufacturers want is a foam material that can deform and protect the head in both high- and low-impact crashes. But given the testing constraints—the fact that this material also has to perform reliably at such a range of temperatures and conditions—companies can’t really use anything else. Activists are pushing to change some of the CPSC standards, Barcott says, but it’s unclear whether they will succeed. Yet considering that kids typically travel more slowly than adults do and are closer to the ground when they fall, kids’ helmets should be designed to mitigate these lower-force impacts. So kids’ sports helmets aren’t a panacea, at least not yet. That doesn’t mean that our children shouldn’t use them—again, they do protect against the most lethal skull-cracking injuries. So if your kid is doing something that has a reasonable chance of ending with her smacking her head against an object with some force—a puck, the ground, another person, a wall, a car—a helmet is a good idea. Some final pieces of advice: Make sure the helmet fits. 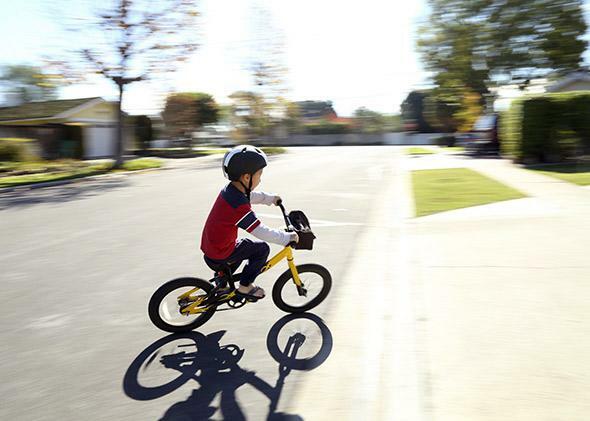 In a 2003 study, pediatricians asked families to bring in their kids’ helmets during check-ups to assess them for fit and found that 96 percent of them were either in inadequate condition or didn’t fit properly. They typically rested too high on the forehead or the helmets moved around too much on the kids’ heads. This video from Safe Kids Worldwide can help determine proper helmet fit. Also, don’t assume that if your kid wears a helmet, his head is going to be safe. You’ve got to use common sense too. As Nicholas Day pointed out in a 2011 Slate article on why he won’t make his kids wear sledding helmets, head injuries are to some extent avoidable with good parental decision-making. “What’s called for are more common-sense instructions from parents to their kids, not another layer of padding,” he writes. Don’t let your kid sled near trees or roads or tons of other people. Don’t let your kid bike or use a scooter or skateboard in busy traffic. Speak up if your kids’ coaches are making them do risky practice drills that involve head collisions, or if they are allowed to head the ball when they play soccer: the American Youth Soccer Organization encourages coaches to not teach or practice heading to kids under the age of 10. Finally, if your kids play sports in which head injuries are common—these include football, soccer, hockey, rugby and basketball—you might put them on a neck strengthening regimen, because “to the extent that you can see a hit coming and you can tense the neck muscles, the head is not going to be moved out of position as much,” Cantu says. Obviously you can’t protect your kid’s head from everything—hell, my 3-year-old bonked his trying to get off his tricycle a few days ago. Nor would you want to, really, as over-protective parenting is not without risks itself. But given the growing medical concern over the dangers of repeated concussions, common sense says that we might be wise to keep our kids’ heads from smacking into things more than they absolutely have to. Helmets don’t clear us of this responsibility.